Dean has made an impression on the competitive stage in Ireland, but he's not finished by a long shot. This 222-pound British beast is coming to a show near you! I was always a good athlete in my younger days as I won quite a few national boxing titles and got selected for school sports frequently, but I knew in myself that I needed something different; that's when I found out about bodybuilding. As a young boy, I would watch Arnold Schwarzenegger films all the time and wanted to be big and powerful like him and other action heroes such as Stallone and Dolph Lungdren. I got started when my step dad brought an old set of dumbbells and a bench press into the house. My cousin and I would try to out-bench each other on a daily basis and my interest in weightlifting began. A few years after, I met my partner of six years and wanted to impress her by building some muscles, so I started training again and could see that I had the genetics to become big and strong like my heroes. 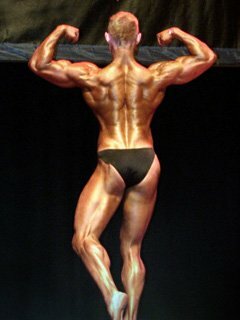 After much research and dedication, I read every article I could on training and nutrition on Bodybuilding.com and decided I wanted to become a bodybuilder and compete one day in a competition. After many years of trying out different training methods and styles, I found this program works best for me. I don't like sticking to a rep range, but I have a number in my head. If I feel I have more in me then I go to failure. Every first set is a warm-up. This is what has worked best for me and this is what my current training program looks like. Abs are trained every day and include two supersets of hanging leg raises, crunches, and oblique machine twists. Cardio every day for 30 minutes - cross trainer, stairmaster, treadmill and out for walks in the morning before breakfast on weekends. This is what my daily intake of food looks like at the moment. During the offseason, I eat a lot more of everything and also add some steak and white potatoes to my diet. I'm also on only five meals now due to being four weeks out from the national championships and having to lose some weight. I eat every 2-3 hours and drink 5-6 liters of water a day. I love bodybuilding because of the lifestyle you can create for yourself. In my younger days, I would go out and party a lot and would not eat well. Since I have started taking bodybuilding more seriously I feel better about myself; I feel more refreshed and my body feels as if it is clean inside. I love the training in the gym - beating yourself every workout is a great feeling and I love it because it has given me a new lease on life that I don't think I would have if I had not started bodybuilding. The guts and passion it takes to get ready for a contest is what really separates the men from the boys! I certainly do not love it, but the end result is always worth it. To me, there is no better feeling than stepping on stage to a cheering audience. This is what makes it all worthwhile. What motivates me at the minute is competition. I have been dieting all year and although motivation levels do drop, the only thing that keeps me going is knowing that I have to step on stage and be in shape for the judges and the crowd. During the offseason, I stay motivated by training for the next competition! I use bodybuilding to make me a better person inside and outside of the gym! This is what makes me want to achieve my goals - to become a better person through training, motivating people, and helping others. After placing second in the junior class at the NABBA Mr. Northern Ireland bodybuilding contest, I have received an invitation to compete at the NABBA Mr. Britain Finals and also been selected to represent Northern Ireland at the NABBA World Championships. Both of these are a dream come true to me and I am currently trying to bring in a harder more solid physique for these shows. 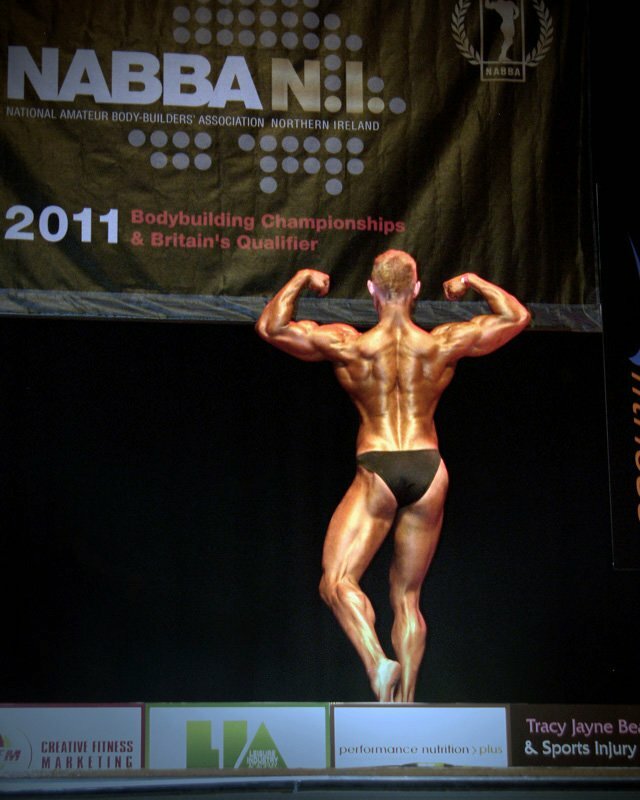 If all goes well at the Britain Finals and I get a top six placing, I intend to go and compete at the NABBA Mr. Universe competition later this year. My plans then are to take a few years off of competing, get some serious size on and come back in 2015 to compete in the Novice class. Lean and mean, Dean is planning to take a few years off to pack on additional mass. The one tip I would give is there is that there's no magic pill or powder that will make you big or lean; there is diet, training, rest, and dedication. You have to have all of these things 100 percent spot on to become successful in this game - so train hard, eat big, and sleep well! Arnold, Serge Nubret, Markus Ruhl, Ronnie Coleman, and Phil Heath. I use Bodybuilding.com for everything. There is no better place for information on training, diet, and competition advice than this website.